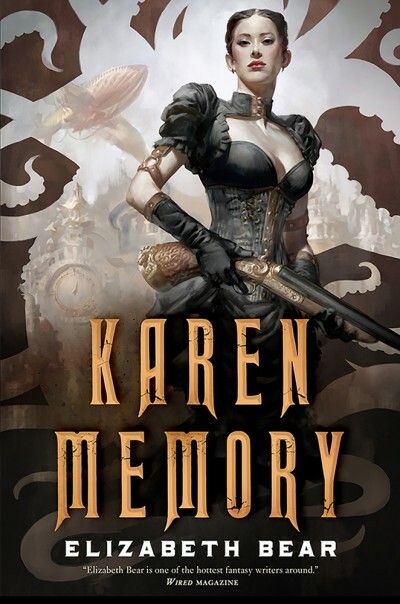 Hugo-Award winning author Elizabeth Bear offers something new in Karen Memory, an absolutely entrancing steampunk novel set in Seattle in the late 19th century — an era when the town was called Rapid City, when the parts we now call Seattle Underground were the whole town (and still on the surface), when airships plied the trade routes bringing would-be miners heading up to the gold fields of Alaska, and steam-powered mechanicals stalked the waterfront. Karen is a “soiled dove,” a young woman on her own who is making the best of her orphaned state by working in Madame Damnable’s high-quality bordello. Through Karen’s eyes we get to know the other girls in the house — a resourceful group — and the poor and the powerful of the town. Trouble erupts into her world one night when a badly injured girl arrives at their door, seeking sanctuary, followed by the man who holds her indenture, who has a machine that can take over anyone’s mind and control their actions. And as if that wasn’t bad enough, the next night brings a body dumped in their rubbish heap — a streetwalker who has been brutally murdered.